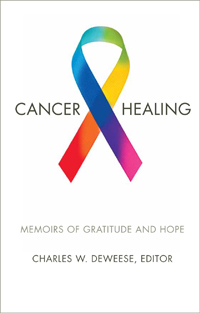 Cancer and Healing: Memoirs of Gratitude and Hope provides firstperson glimpses into the cancer experiences of eighteen Baptists. In fact, every person connected with this book, including the publishing director, editor, and writers, has had and/or currently has cancer. Their very lives comprise the primary resources of this work. Since more than half a million people die in the United States every year from cancer, writers included in this volume feel a strong sense of gratitude and hope. They share passionately about their own survival experiences and compassionately for those who do not survive and for those for whom the announcement of cancer may picture into their tomorrows. Autobiography, honestly written, can provide extraordinary insights into basic human achievements and dilemmas. Writings about oneself, including experiences, attitudes, and lessons, can penetrate deep into one’s identity and can even expose one’s vulnerabilities. While risky, such efforts at laying out the soul constitute the true stuff of a person’s life situation. This book takes that risk, believing that while frank and open talk about a particular illness—cancer—can get intensely personal, the purpose is to help readers deal redemptively with cancer and its treatments and side effects. These writers, male and female, white and black, live in ten states. They have suffered various cancers: carcinoma, leukemia, lymphoma, multiple myeloma, melanoma, and others, which have affected many parts of their bodies and emotions. They have not written to make money. All royalties from sales of this book will be donated to the American Cancer Society. Each contributor knows the suffering related to cancer and its treatment. More importantly, each has experienced a growing appreciation for the healing power of God and biblical values as a consequence of being forced to delve into a dark and difficult world.